The Year 6 children have worked so hard rehearsing for their end of year musical production, and what a delight it was. The audience were taken to the far away land of Mambica where two opposing tribes seem unwilling to put an end to their enmity. Only the gift of a new-born child can bring peace. The moving story-line and lively songs thrilled the audiences over the two main performances on Wednesday and Thursday and the dress rehearsal to the rest of the school on Tuesday. We'd like to thank Framlingham College for allowing us to use the wonderful Headmaster Porter Theatre, plus all the support from their crew with sound and lighting. We are also extremely grateful to have been given the stunning material for the costumes kindly provided by Amanda Brooke-Smith (Tsonga Textiles S.A.) and beautifully made by Mrs Monk. More photos will be added to the gallery pages on the website shortly. Today at gardening club we were surprised to see how big some of our vegetable plants had grown. We got lots of weeding done and were also able to harvest some radishes and garlic. Some of the radishes were HUGE!! On Wednesday, we had a visit from Mr Collins, one of our Daddies, who brought in his loading shovel for us to look at. He told us all about it and we even got to climb up and sit inside it if we wanted to. We talked about how it was similar and different to our cars. They both have lights and four wheels but there were more things that were different than were the same. We learnt that the engine was at the back, the exhaust was on the top and there was only one seat. The children wanted to know if there was any place for him to keep his lunch and were reassured that there was a special place in the cab. We talked about how to keep safe around the vehicle too. What fun seeing such a huge vehicle on our playground! Earlier this week, children in JA and VW had the opportunity to go through a dry run of yesterday's landmark vote that will affect the country’s electorate. We watched a presentation about this subject. We looked at both sides of the debate as to whether or not we should remain in Europe. It was extremely interesting when we considered the impact of leaving or staying in the E.U. The children had the chance to cast a ‘stay’, ‘out’ or 'abstain' vote marked on pieces of paper and then counted when the voting closed. The referendum is a general vote by the electorate on a single political question that has been referred to them for a direct decision. The majority voted for the country to stay in Europe. 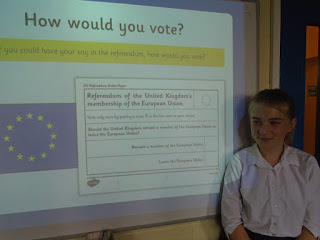 Our mock referendum was both a serious and fun way of raising awareness on a historic decision that will have far reaching consequences for all citizens, especially young people. It was a very interesting lesson and everybody learned a great deal. Today, it seems our views and the result do not reflect the feelings of the real life voters. Which liquid causes the most decay in teeth? Class LH have been testing out which liquid would cause the most decay. We set up a fair test using equal amounts of liquids and eggshells. The variable element was the type of liquid we used. The eggshells represented the enamel on our teeth. We used orange juice, vinegar, water and Coca-cola and placed the eggshells into an equal amount of the liquids. We then left them for a week to see what would happen to the enamel (eggshells). We made our predictions as to which liquid would cause the most decay; 5 predicted vinegar; 1 predicted orange juice and 22 predicted coca-cola. The egg shell in the water remained unchanged. The eggshell in the orange juice had a white covering representing the plaque formed by natural sugars. The Coca-cola surprisingly just stained the egg-shell. The vinegar in the egg-shell caused the most effect as it was acid - the egg-shell became soft and some of it disintegrated. This shows how important it is to clean our teeth to avoid decay from the acids which build up in our mouths. Remember; 2 minutes brushing twice a day will help reduce tooth decay. Having seen the results, LH have vowed to have shiny white teeth for evermore!! 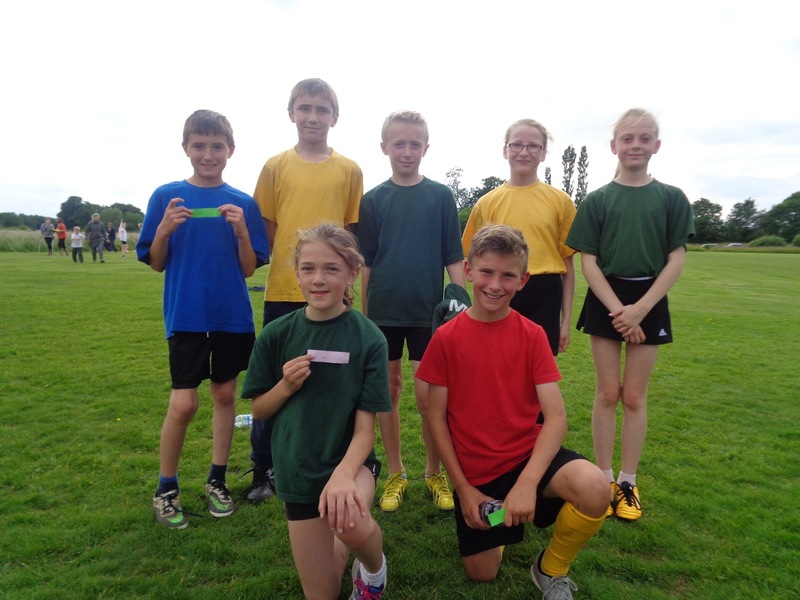 On Friday the School Cross Country Team travelled to Mellis Common to compete in the HSSSP Cross Country Finals. Every Framlingham runner completed their race successfully with great speed, discipline, agility and coordination and all are to be congratulated for their excellent efforts and fine achievements in progressing this far in the competition. All Framlingham runners finished in the top 15 places in their respective races with a few achieving a highly commendable top 10 finish. Special mention must go to Catherine who finished a very impressive 4th place meaning that she is one of the top 5 runners in the whole of Suffolk. Well done again to all runners who competed and as the song goes "Keep on running". Just a few photos from yesterday's County Music Service Music day at St Michael's Church. All of our Year 4's joined other local schools for an ensemble day. Our year 4 pupils all receive weekly tuition in either clarinet or cornet from the CMS, this service is funded by the school. The school are delighted to receive a new beautiful bespoke Chess trophy for our Trophy cabinet in the reception area. 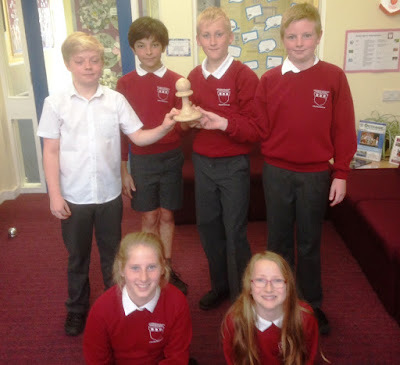 The house chess tournament this year was won by Howard in April, so we were able to present the players from the winning team with their new trophy in Monday's assembly. It has been made by Bevis Sale, a sculptor and woodturner from Southwold. Mr Sale is a friend and woodland neighbour of Mr Byer, from Flixton where they each own a wood. He spent several hours hand-turning and creating this wonderful chess piece from ash. The school would like to thank Mr Sale very much for this wonderful trophy and also to Mr Byer for arranging this for us. We were lucky enough that the rain held off for the afternoon too, so that the children in Foundation and Key Stage 1 also were able to take part in Sports Day. The field was packed with parents & grandparents ( mostly in wet-weather gear just in case!). 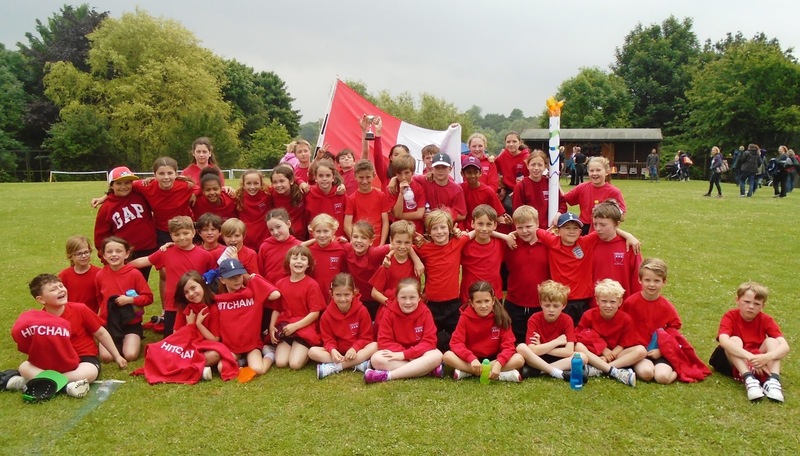 Well done to all the children for your brilliant running, jumping & hurdling, and for doing so well in the 3-legged race, Space Hopper race, Beach Bucket race, Egg & spoon race or Toddler race. A lovely way to end the school week. Thank you to everyone who kept their fingers crossed for no rain during the day! A tremendous effort was put in by all the pupils to their individual and team events. We hope all the parents and grandparents enjoyed the morning. Thanks also go to the Friends who supplied parents with some wonderful summery Strawberries and Cream. Sorry that we couldn't supply the sunshine to go with it! This week, year 3 and year 4 have had a visit from the dental hygiene nurse who came to talk to us as part of our healthy eating and teeth topic. We learnt on Tuesday about the surprising amount of sugar that there is hidden in cereal bars and savoury products that we eat. We examined packaging and even the “healthy” bars had a lot of sugar in!! 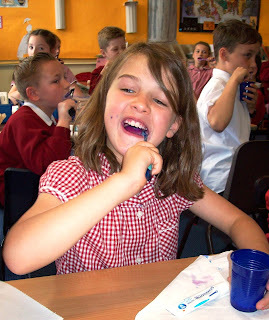 Today, we have learnt how to look after our teeth properly and how to clean them thoroughly. 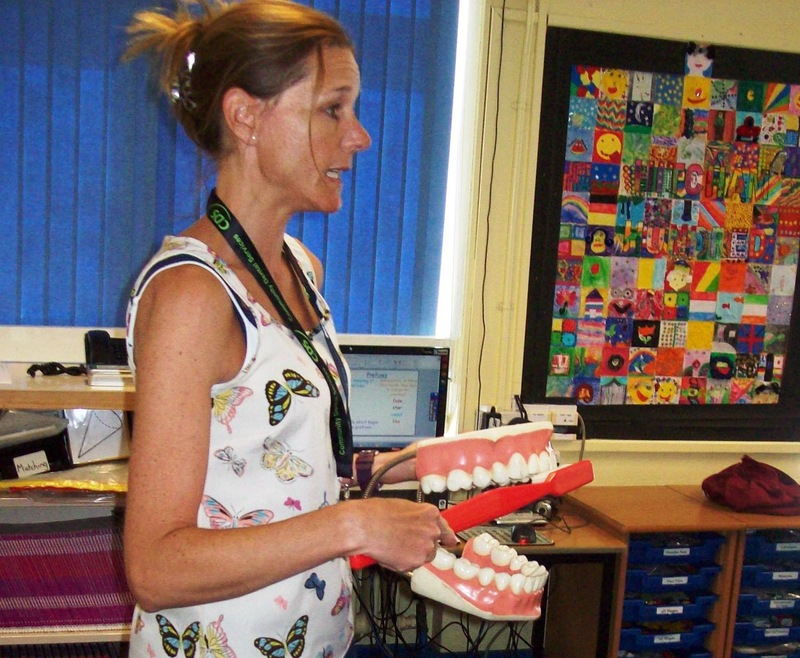 We used disclosing tablets which revealed the good and bad plaque on our teeth and gums. We examined our mouths in a mirror. After that, we were shown how to clean them properly – brushing each surface of each area in the mouth for an appropriate amount of time. 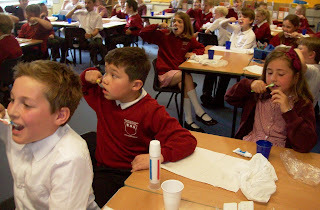 It was great fun but also very interesting as many children thought they had cleaned their teeth well this morning!!! Who's that tickling my back? All these minibeast pictures have been carfeully created from items from nature that the children have gathered. This year KS1 went on their trip to Felixstowe. First they visited Landguard Fort and it’s nature reserve before heading up the beach to near the spa pavilion. The children had a great time beachcombing on the nature reserve and found many wonderful treasures. In the afternoon they had fun paddling and building sandcastles on the beach. Thank you to all the helpers who came with us as well as Chris and all the staff and Landguard Fort. We all had a lovely day. What a treat today for the Nursery children and those in class VW. Ms Chesman, mum of Erin in class VW, brought in an orphan lamb to school today. The Nursery children had an exciting time feeding and petting the lamb, while the older children asked questions of Ms Chesman and heard about what she has to do to care for the orphan lamb.